The Dollar is Crashing! The Dollar is Crashing! Such is the perennial claim of doomsday predictors, conspiracy theorists, gold bugs, etc. Those of you who read my blog regularly know that I often come to the defense of the Dollar. Given that it has risen by more than 5% over the last month and is currently hovering around its average value of the last five years, I think this position is worth reiterating. In the months leading up to the expansion of the Fed’s Quantitative Easing Program (QE2), investors took an especially bearish view on the Dollar, precipitating a rapid and steep decline against most currencies. Analysts argued (somewhat contradictorily) that QE2 would be ineffective in the short-run and inflationary in the long-run, and that most of the new cash would be invested abroad – where returns are higher – rather than in the US. Since the unveiling of QE2, however, the Dollar has rallied strongly. On the one hand, most economists remains skeptical that it will do much to lift GDP and boost employment. However, a parallel thread holds that this was only the ostensible motive for QE2, and that the real motive was to prevent the outbreak of another financial crisis and consequent economic downturn. Given that housing prices are headed downward and banks’ balance sheets are still weak, the Fed’s move reads more like a preemptive move to further shore up the financial system than an economic stimulus program. At the very least, this probably won’t hurt the Dollar, and certainly not to the extent that the market had priced in prior to QE2. 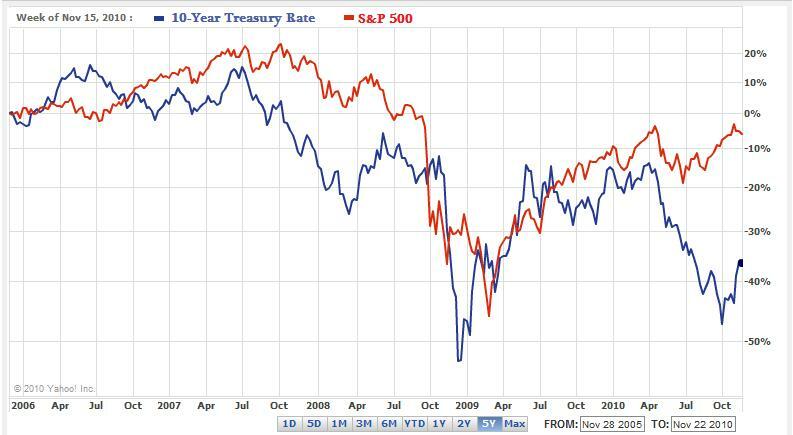 While the stock market rally has stalled, the rise in Treasury Yields has not. The 10-Year rate is close to 3% for the first time in months, making it more attractive (and less costly) to hold capital in Dollar-denominated assets. The Dollar was also helped by the release of GDP data for Q3, during which the US economy beat expectations and grew by 2.5%. As a result, traders are reducing their Dollar-short positions. Analysts have revised their forecasts to reflect a stronger Dollar, based on the notion that “The dollar has found a bottom.” At this point, the main naysayers are “overwhelmingly found in the ranks of the opposition Republican party,” perhaps part of a cynical ploy to hurt both the economy and Barack Obama’s chances of being reelected. 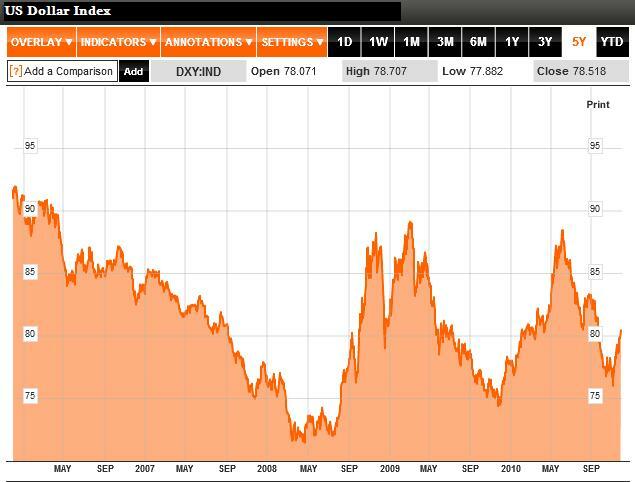 To be sure, there may be other reasons for the Dollar’s rally, namely the growing turmoil in the EU. Evidence is mounting that the EU sovereign debt crisis is spreading, which has spurred both an increase in investor risk aversion and a decline in the Euro. Still, market chatter seems to be focusing less on the Dollar as safe-haven and more on the fact that the Dollar was merely oversold. Yes, I agree. I beleive the US Dollar has some legs.. I think we are about to see a bit of a recovery.. (for the dollar, not necessarily the economy. Really? Perhaps it’s because I’m sitting in the UK and am therefore closer to the euro zone crisis, but it seems to me the rise of the dollar has lots to do what’s happening in Europe and not much to do with QE2. It’s only in the last two days or so that dollar strength could be said to be more than short term (i.e. not haven based) because investors think the euro zone crisis could extend into the far future, encouraging longer term investment in the US.